When trying to market your company blog you have to look for a community with real members that would be interested in your products or services. You have to look for a marketing strategy that will give you a good return on investment and generate your blog traffic. The traffic generated to your blog should be coming from two directions and that’s Search Engines and Direct Traffic. One community that can solve your needs when it comes to marketing your company blog and that’s Blog Engage. 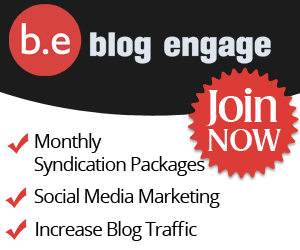 Blog Engage offers a unique opportunity for you to market with your blog to thousands of other bloggers while at the same time increasing your search engine ranking positioning. You might be asking how Blog Engage would help increase both your direct traffic an search engine traffic? Blog Engage actually syndicates your blogging contest into their portfolio of social networks such as Blog Engage, Blog Serp, Top Blogged, RSS Leak, Blogger Ink and Blogger Tag. All of these websites are DO Follow meaning they pass their page rank juice right to your article and over time Google ranks your target keywords and articles higher because you have increased the amount of backlinks that are linking to your blog articles. All Business, Platinum and Gold Membership Customers are included as a “Sponsor” in all of Blog Engages Guest Blogging Contests. As their contests grow so do the contestants entering and participating. 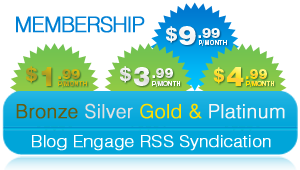 This year in 2011 Blog Engage will be giving away a total of 3000 USD. Their contestants are given bonus points for writing individualized sponsor reviews, these would be reviews of you the RSS Customers. As the contestants battle for first place writing the sponsored review is very important to becoming a winner. Therefor this will increase the amount of blacklinks to your website and again will increase your search engine ranking positioning for target keywords. The Blog Engage RSS Service also automatically tweets your published articles to all of @bbrian017’s 2500 followers. Your Published content will also be shared with our facebook fan group Blog Engage with over 450 friends. Engagging inRSS service is effective in online marketing. This is great stuff you have here. Opens the minds of the readers on what they can do to promote their blog. I heard alot about blog engage but the information seems pretty new to new, because all these things you mentioned are petty helpfull in getting better ranks and all this. Thanks And I might be convinced to take something. BlogEngage definitely has tons of fantastic benefits to membership, and their contests are totally upstanding and enjoyable for everyone who participates. Every blogger who is a member has nothing but positive things to say, and wholly enjoys their time there. It sounds like Blog engage would be a tremendous help. Thank you for sharing all of its features. The tweeting and posting to facebook alone would save time. Blogging is a great way to develop back links and gain readers in the community. Blog Engage is a good place to start as their are a friendly group of bloggers here. RSS feeds are a great way to maintain readers. It’s important to find ways to reduce promotion, there’s only so many hours in the day and that’s it. Blog Engage sounds ideal, especially to start getting your blogs off the ground and gaining backlinks. We’re looking at starting our company blog very soon, so we’ll certainly look at using Blog Engage. This looks like an amazing tool! We are new to blogging but I look forward to reading more! Building backlinks in BlogEngage is great. When I know about BlogEngage I was amaze how it helps you to build more links from your site. RSS feeds is important too. Anntte Golphin recently posted…Timber Windows – a renovators delight.